Distance education is a facility for that student, who leaves his study due to any reason, like - lake of money or other difficulties. The government started this education system to get higher education from home. They opened the study center and provide assistance to the student to submit his consignment and get study material from the single window system. The number of children benefited from this education revolution and successfully run with other educated people. So, many people think that this distance education system is easy from Regular Courses. This is his wrong thought. Distance education course material is more difficult then a regular course and those students pass this course, his capacity and knowledge level are as good as a general student. After passing the 12th class, some student is not able to take admission in Regular courses. In that case, Distance Education is a good option to complete the desired courses. The employed person can also take admission to complete his education by continuing his service. Every year the number of students take admission due to non-restriction of age. As described above, here want to add more things. Those students, who unable to continue education through regular courses, will take admission in distance education. They attend classes in the evening or morning and do other work for the rest of the day. The basic concept of distance education is that a student can make his schedule as per his choice. The number of places in India is vacant from a university. The student belongs to that place benefit from distance education. Courses payment method is easy and low from other universities. That help to poor student to continue his education. Distance learning is changing with the present scenario. Technical equipment is adding to a learning module. They provide the visual classroom for learning, video conferencing, interactive online learning, etc. These tools attract student and make everything easier for them. They asked the question online to expert teacher. Internet and CD are also playing a vital role to support them. They get the recorded module of a subject and get knowledge intently. They are using online chatting facility and ask a question directly to the concerned person and share views online with each other. So, many students are using mobile and teleconferencing technology to learn his subject. That student, who could not be taken admission in Regular Courses in BCA, BA, B.Com, go with distance learning program. The student who did not get good results in 12th may apply in DE for any restriction. Distance education system provides professional degree with working experience, that is the great advantage for the student. This education system facilitates provide an option for the student to take admission in two courses at the same time. That helps to save money and time of student. Overall these are very helpful to all student of the remote area too. 1. 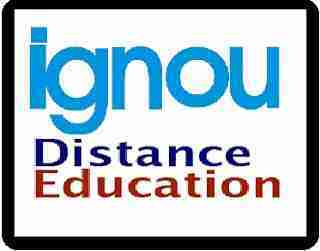 IGNOU.AC.IN - This very renowned and good open university. Overall these are the best way to get the education online or offline from anywhere.